After anxiously waiting, I finally had the chance to take the new Sigma 14mm f1.8 DG HSM ART lens out under the stars. When I got the heads up that the lens would be on the way, I immediately started making plans. 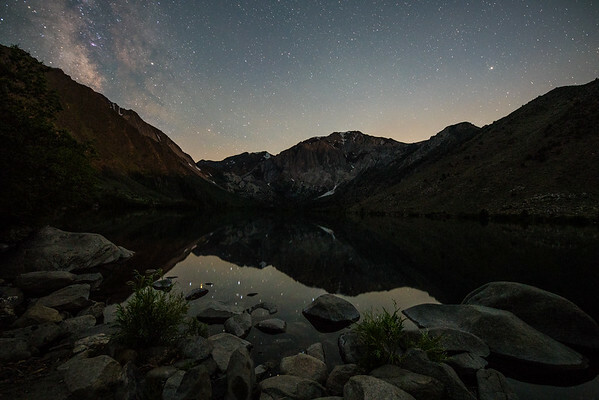 I ended up deciding on the Eastern Sierra mountains and hitting a few spots that have been on my list for a while. Up until now, the Sigma 20mm and 24mm f1.4 ART lenses have been my go-to wide angles lenses for night photography. As much as I've loved shooting with those lenses, I've been missing an ultra-wide angle lens in my bag. On this trip, I'd be shooting with my Sony A7RII and using the Sigma MC-11 adapter to attached a Canon mount version of the Sigma 14mm. A 14mm lens is nothing new on the market, but one that shoots at f1.8 certainly is. 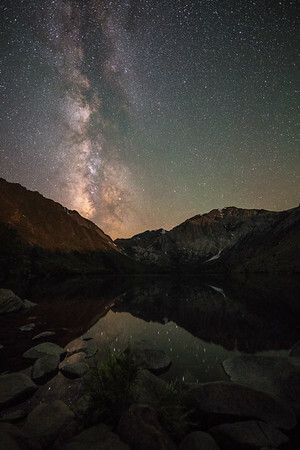 When it comes to night photography, that extra stop + of light is a huge advantage. It means brightening up an incredibly dark landscape a bit more or being able to lower your ISO to help keep your images clean. While I was waiting for the Moon to fully set and the Milky Way to move in to position, I took a few these to compare results from shooting this scene. 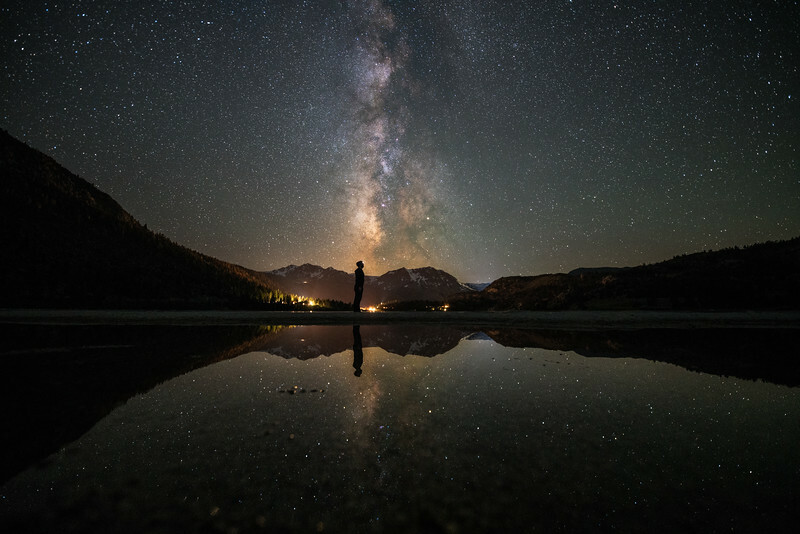 Both images were shot on a Sony A7RII at 30 seconds, ISO3200 and f1.8 and f2.8 respectively. Edits were done in Lightroom with the same settings pasted on both. The images were taken a little under 3 minutes apart. 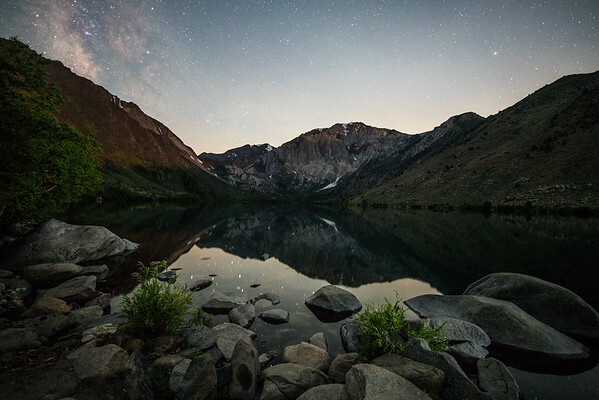 This was the final image from Convict Lake that I was waiting to shoot. With the Moon fully below the horizon, this place was incredibly dark. I couldn't believe how bright the Milky Way was shining over the mountains. While shooting, I was experimenting a bit with shorter exposures to keep the stars from trailing, so having more than an extra stop of light definitely made a difference. I lucked out as just a few minutes later and the wind picked up and killed the reflection on the lake. With the Moon setting after 1am, I only had a short window of dark skies during the two nights I'd be shooting. I didn't get to hit all of the locations that were on my list, but I had a blast heading from location to location and trying to see what I come back with while shooting with the 14mm. Here are a few of my favorite images from the trip. 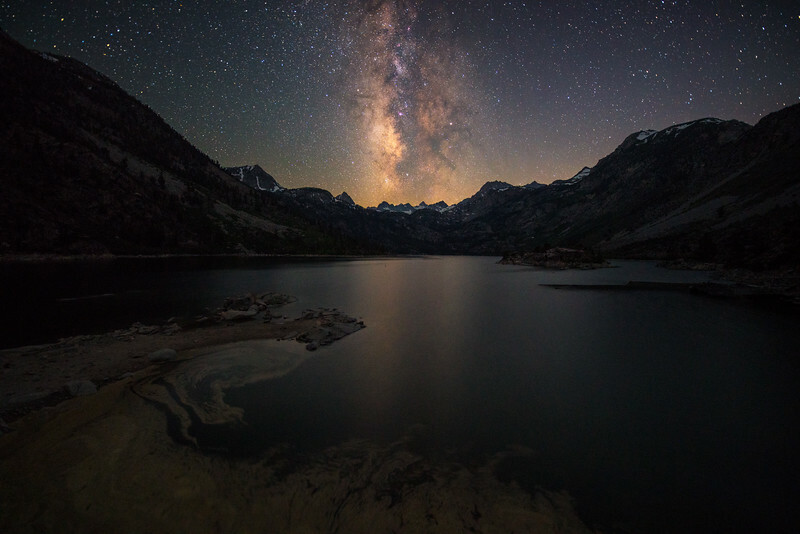 Sitting at over 9,000ft elevation , Lake Sabrina was one of the spots I was most excited to shoot visit. Due to it's location being a bit further from the rest of the spots I had planned, I saved it until my last night. I was originally hoping to use a bit of Moon light to help illuminate the scene, but the Milky Way wasn't quiet in the position I wanted. I could have taken a few photos when the Moon was still up and then composited it with a frame taken of the sky a bit later, but I prefer to capture my images using a single exposure. I shot this at a slightly lower ISO than some of my other images and relied on that extra stop from shooting at 1.8 to help bring out some detail. During the day, Bishop hit over 100 degrees, by the time I was made it to Lake Sabrina the temperature was in the high 40's. I didn't spend as much time I would've liked here, or any of the locations for that matter, so I definitely hoped to return soon. June Beach wasn't originally on my list of locations to shoot, but after scouting during the day I knew I needed to adjust my timeline so I could fit it in. With the short window between Moonset and astronomical twilight, plus the fact that most of my compositions were facing South / South West, it really made hitting all of these spots a bit difficult. Normally I would spend a bit more time trying different compositions, but I probably shot 5-6 images at each spot and made my way to the next. Although I've had just two nights of shooting with the 14mm, I'm confident it will rarely be leaving my camera. Thank you again to my friends at Sigma for getting me an early copy of the lens to head out and explore with. Click below to see a full gallery of images from my trip and be sure to follow along on Facebook and Instagram.